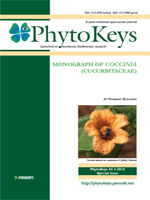 This monograph deals with all 95 names described in the Cucurbitaceae genus Coccinia and recognizes 25 species. Taxonomic novelties are Coccinia adoensis var. aurantiaca (C.Jeffrey) Holstein, stat. nov., C. sessilifolia var.variifolia (A.Meeuse) Holstein, stat. nov., and C. adoensis var. jeffreyana Holstein, var. nov. For the 25 species 3157 collections were examined, of which 2024 were georeferenced to produce distribution maps. All species are distributed in sub-Saharan Africa with one species, C. grandis, extending from Senegal in West Africa east to Indonesia and being naturalized on Pacific Islands, in Australia, the Caribbean, and South America. Coccinia species are dioecious creepers or climbers with simple or bifid tendrils that occupy a range of habitats from arid scrubland, woodlands to lowland rainforest and mist forest.